A man entered the Hollywood branch of the California Bank at 3900 Sunset Blvd. early this morning to make a withdrawal – at gunpoint. Brandishing a revolver, the robber forced bank manager P.A. Beaton, assistant manager C.R. Gray, and Deputy United States Marshal Dave Reynolds into a back room, locked them in, and then stuffed a sack with $4000 ($47,514.02 USD 2007) in cash. At the same time the bandit was hurriedly jamming money into a bag, Marshal M.A. Duarte was waiting outside wondering what was keeping his fellow U.S. Marshal from their meeting. Much to Duarte’s shock, a few moments later he encountered a man exiting the bank clutching a bulging sack of money in one hand and a revolver in the other. For a split second their eyes locked – and then the thief saw Marshal Duarte reach into his pocket. He quickly realized Duarte’s intent and fled down the street with the marshal in hot pursuit. Midway down the block Duarte began to tire. Huffing and puffing, he sputtered to a stop and fired two shots. At the crack of the first shot the bandit flung his booty to the ground. When the second shot whizzed past his head he threw down his gun. Duarte fired a third shot just as the fleeing felon was about to board a streetcar and escape. This time the man raised his hands to surrender. The suspect gave his name as Gus Palovack aka F.J. Palivas, of 1017 Monterey Road. 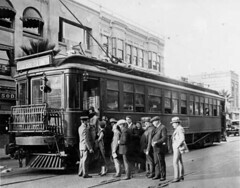 One of the most perplexing aspects of the case, other than why he chose a streetcar as his means of escape, is what drove Gus to bank robbery. Known about town as a realtor with political connections, Gus owns property and has several accounts in a number of downtown banks. Hard work and a knack for saving money may be the reasons for the bank accounts and real estate holdings – but police don’t think so. They believe that Gus has recently made similar withdrawals from other local banks. Gus is charged with the robbery of the California Bank, and two robberies of the same branch of the Commercial National Bank located at 1572 Sunset Blvd. Bail is set at $25,000 ($296,962.64 USD 2007). Gus either abandoned his brief career as a bank robber or became more adept at it, because there are no further mentions of his exploits in the Los Angeles Times after June 1927.